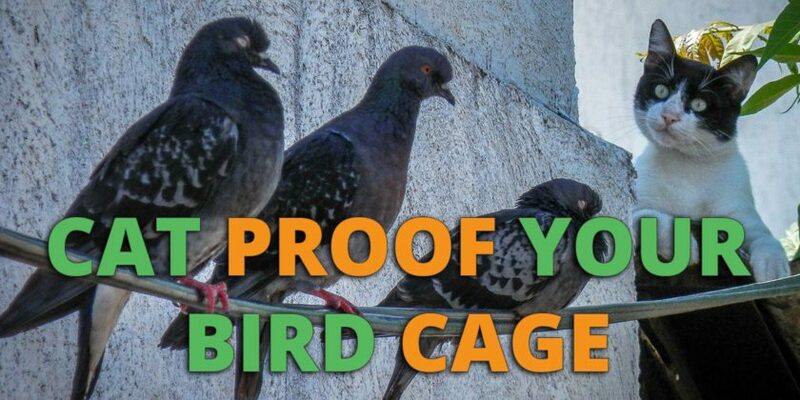 Smaller and lighter cages can easily be jumped on and knocked over by a cat or dog – injuring the bird inside. If you’re using a ground based cage (which is usually the case with larger sized birds) then you want this cage to be heavy and sturdy. We recommend this bird cage if you’re looking for a good quality, heavy and sturdy cage. Smaller sized birds use smaller sized cages which can be suspended off the ground. These are much more difficult for a cat to reach. However, it’s very important when hanging a bird cage that you do not use a bird cage stand because this is very likely to be knocked over by a cat or dog. Instead, only use hanging bird cages that are suspended from the ceiling using a chain. Click here to see a guide on how to do this. Also, make sure the hanging bird cage is not within leaping distance for the cat or dog. Prevent your birds from escaping, especially with parrots which are intelligent creatures that can solve puzzles. Stop your cats from opening the bird cage door and getting access to your birds. A solid bird cage door is also a definite bonus. Check out our entire article to securing your bird cage using locks and latches available here. The spacing between the bars on your cage should not allow the paws of your cat to fit through them. 1/2″ to 3/4″ bar spacing is a sensible size to aim for with a thickness of 2mm to 2.5mm. Also, you want the bars and wires to be made from metal and not plastic simply because it’s stronger. This is especially true for outdoor bird cages and aviaries. A steep roof design on the top of your cage will prevent cats and other types of predators from sitting on top of the cage, frightening your birds. A cage cover can be placed over your birds at night time to provide an extra feeling of security, away from the preying eyes of a cat. Provide your bird with plenty of places for it to hide within the bird cage. This involves installing toys, perches and especially nest boxes which they can go into if they become frightened. If you simply want to keep cats and dogs away from your pet birds then check out the tips below. They work especially well with outdoor aviary and bird cage environments. Cats and dogs dislike the smells of certain objects. One of those smells is citrus based fruits such as lemons and oranges. You can place fresh lemon and orange peels around you bird cage to discourage cats and dogs. You can also buy certain smell based repellents such as this spray which offers a similar solution. Best to only use these in outdoor cages and aviaries since birds have sensitive lungs. There are certain sounds that humans can’t hear because they are at a frequency higher than human hearing. However, cats and dogs can hear this sound and it will annoy and frighten them away. There are motion detector based solutions which will trigger only when a cat or dog is near and these can be used to deter them from getting near your bird cage. Having a water spray on hand is always useful for squirting at any cat or dog that gets near your cage. You can also get motion detecting sprinklers that will ward off any detected predators. These indoor mats provide a small electric shock to any animal that walks over them. This small shock gives a jolt that isn’t strong enough to harm your pet but is annoying and will soon teach it to avoid your bird cage. One of the most popular ones to check out is the ScatMat. Cats simply hate the smell of some plants and will avoid them so you can place these near your bird cages. An example of one such plant is coleus canina. Cats and dogs can be trained to get along with your pet birds. But first you must understand that birds are the natural prey of cats and dogs, so birds can become very frightened by them. Also, you should never, ever leave them alone together. Whilst they might seem friendly whilst you’re around, you never know when a dog or cats killer instincts might kick in. Follow this rule above all the others. When first getting your birds to know one another, do this very slowly. Keep the bird inside it’s cage and get the cat or dog into the room whilst it is still on a leash. You should also time the introduction after your dog or cat has had it’s meal. If your bird is frightened or scared then take the cat out of the room. Also, watch the dog to ensure that it is not looking at the bird as if it were a meal or is trying to hit it with it’s paws. You want each animal to be able to rest by themselves without disturbing one another. Should your cat or dog start acting aggressively then keep a bottle of water ready to spray at them as a punishment. The punishments don’t need to be serious, even a loud firm ‘NO’ will do. The saliva is harmful to birds so don’t allow any licking. This’ll allow your birds to know if they’re ever nearby. Your cat or dog is then less likely to play with the birds if they have multiple toys and distractions. I found a parakeet in a tree in my yard last night. I happened to have a decorative bird cage so I put the parakeet in it along with water, lettuce and crackers for overnight. I’m thinking of keeping it but I have a cat that’s very much a huntress. Any suggestions on cage, etc. to protect the bird from my cat. They’ll be useful to house the bird whilst it regains it’s health. Otherwise just follow the tips given in this article and keep the two separate! I recently came into an interest of getting a Green-cheeked parakeet. we know that we have to get an appropriate sized cage, give it attention, and obviously take care of it. Problem is that we have 4 cats! while 2 of them would peacefully lay on the cage (we would get a slanted cage so that would no longer be a problem) while the other 2 would intensively watch and I fear might, attack, the bird. Would these tips in the article work on all 4 cats at once or would we have to separate them and make it so they don’t even know they exist? If you already have 4 cats then I’d very much advise against getting a pet bird unless you can fully separate them. This will really stress the bird if you allow it to be surrounded by 4 of it’s natural predators. You’d want them to be in completely different areas of the house with no contact, otherwise your bird will be terrified. Why would a dog sit and whine at a bird in a ceiling hanging cage? Can a dog kill a parakeet by staring at it in a cage? or cause it to pass out? A dog can’t kill a parakeet just by staring at it but it can cause it a lot of stress and anxiety. 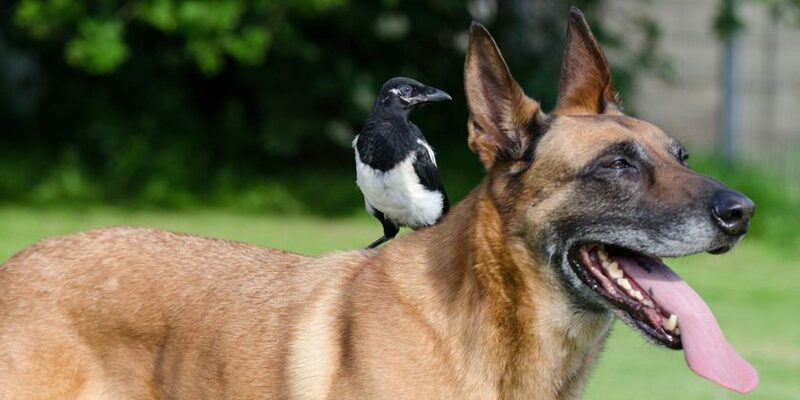 We’d recommend keeping your dog away from your birds untill they have been introduced together properly. Even then, never leave them on their own – always be around them when they’re near each other. I’m the owner of two cockatiels and have had the idea of get a cat to keep me company but have been worried about introducing my two birds to a kitten. What’s the best way to approach the situation? # 2 – Take things very slowly. #3 – Introduce the cat after it has eaten it’s meal. #4 – Don’t expect them to get along immediately, it could take a days or even few weeks. 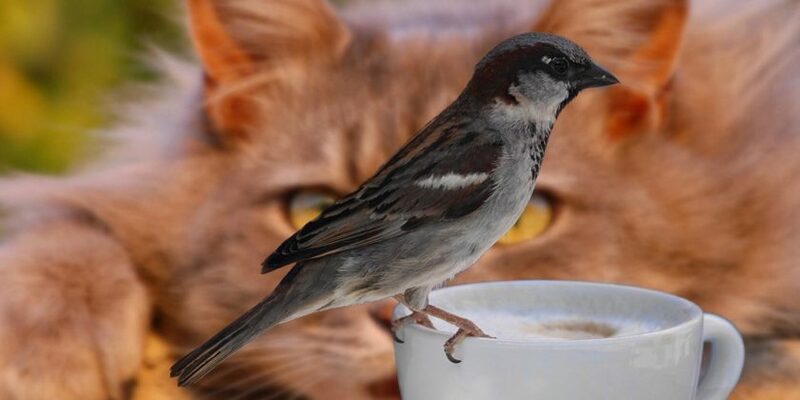 #5 – Always be present when birds and cats are mixing together. Do NOT leave them alone together. 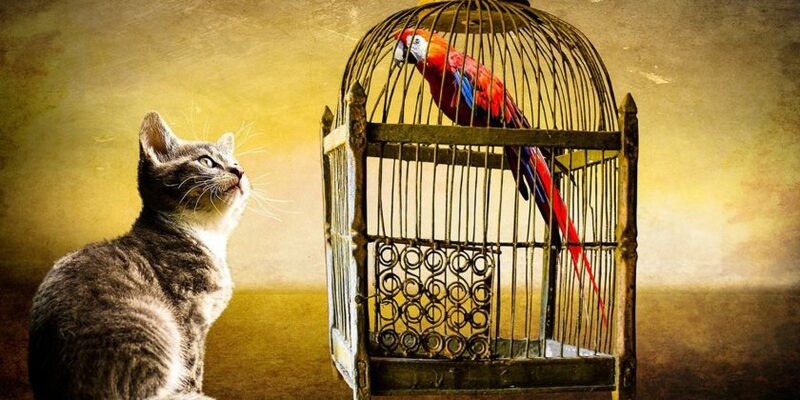 #6 – Don’t allow the cat to sit on top of the bird cage or paw at your birds – even if it is playful. Hi, I’m curious about the sscat repellent under the cage but am worried about the dangers of aerosols to birds. Any thoughts? You’re right, it’s best to be on the safe side and stick to one of the other solutions if your bird is kept indoors. Only use a SSCAT repellent outdoors.